Center Global Education and Charitable Fund. Photo courtesy of the author. Anyone who grew up in the seventies, as I did, will remember with fondness the late nights/ early mornings spent watching Muhammad Ali slug it out against the likes of boxing superstars, Smokin’ Joe Frazier, George Foreman, Leon Spinks etc on television. Whether you liked boxing or not, everyone had an opinion of Ali. His exploits in and out of the ring have become the stuff of legend and need no rehearsal here. One of the lesser known facts about Ali is that he was of Irish extraction on his mother’s side. Odessa Lee O’Grady was herself the daughter of John Lewis O’Grady and Birdie Morehead. Her paternal grandfather was a white Irishman named Abe O’Grady, who emigrated to the United States from Ennis, County Clare soon after the American Civil War. 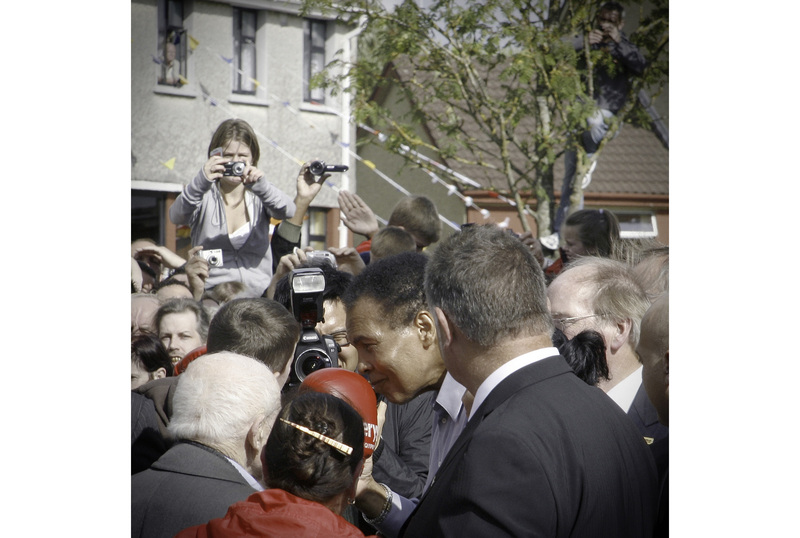 Muhammad Ali walks through the streets of Ennis. Photo courtesy of the author. I was fortunate enough to meet Muhammad Ali in September 2009 when he visited the town of Ennis to formally receive the Freedom of Ennis and launch the Alltech – Muhammad Ali Center Global Education and Charitable Fund. He was here as a guest of Dundalk native, Pearse Lyons who is also the CEO and founder of Alltech. Alltech have an Irish base in Dunboyne, County Meath but their international headquarters is in Louisville, Kentucky – the hometown of Ali. While Ali received his Freedom Scroll indoors at the Town Hall (relayed via video link to the crowd outside) I staked out Turnpike Road nearby, where it was rumoured that (weather-permitting) Ali would stop long enough to unveil a plaque at the site of Abe O’Grady’s former homestead. 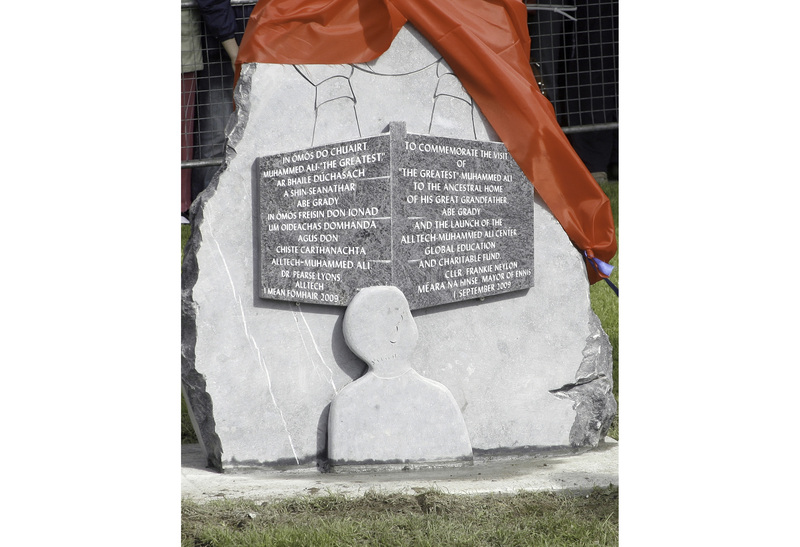 Commemorative statue marking Ali’s 2006 visit to Ennis. Photo courtesy of the author. And so it came to pass. When Ali’s motorcade arrived, he made a bee-line to greet the fans who, like myself had waited hours in the hope of a glimpse of the great man. He graciously accepted any presents or momentoes presented to him and even took the time to ‘mock’ spar with a young lad sporting bright-red boxing gloves. 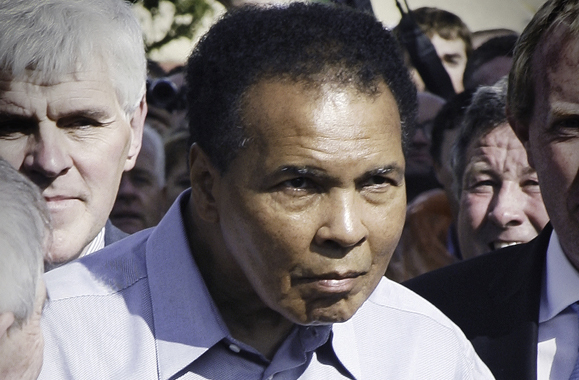 Unfortunately most people’s view of Ali was impeded by the unedifying spectacle of a swarm of local politicians vying for space to be photographed beside ‘The Greatest’. Ali dutifully unveiled the aforementioned plaque before making his way over to the press corps to pose playfully for photographers – with both arms extended in a boxing stance. Although visibly aged and strangely silent, he was in great spirits throughout. Parkinson’s had robbed him of both the voice and the agility that were once his stock-in-trade. What remained however, was the easy way he had with people as he acknowledged all comers with a wink or a smile. All too soon he and wife, Lonnie were whisked away to Dromoland Castle for another private reception, before boarding a flight at Shannon the next day.